Earlier today the island's departments of culture and festivities unveiled the details behind the 2018 edition of Música a les Places. 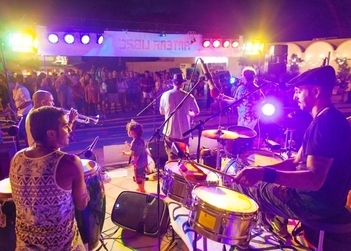 The open-air concert series is a shorthand for early summer and warm weather; crowds feature a mix of tourists and locals, and the concerts are aimed at promoting culture and engaged and vibrant community spaces. Culture secretary Susana Labrador described the outdoor concerts as “an enduring crowd favourite”. Starting Monday and continuing every week through September, Música a les Places signals the arrival of a dizzying array of groups and musical styles in Sant Francesc, Sant Ferran, es Pujols and, this year for the first time, la Savina. With Dilluns al Port (“Mondays in the Port”), from early June till later September, music lovers can enjoy live music on the town's marina promenade from 10.00pm. Es Pujols is gearing up for two music series of its own. On Thursdays, mid June until September 20, World Music takes plaça d'Europa by storm with live performances by Antena Libre. The evening starts at 10.00pm in June and September and an hour later in July and August. Latin fussión and musical group La 22 take over the same plaza every Tuesday at 10.00pm from June 12 to late July. Weekly concerts are in store in Sant Ferran, too, with Música en viu (“live music”) in the square on Fridays at 10.00pm from late June to September 28. And on Saturdays in Sant Francesc's central plaza, there's music by Formentera's favourite jazz band, Jazz & Co.
From the beginning, Música a les Places (“Music in the Squares”) has had the support of Jazz & Co and Antena Libre. This year, the neighbourhood association of la Savina joins the list of sponsors. The series is about preserving and promoting music in all its forms and creating spaces for live musical creation. The 2018 edition of Música a les Places finds the Council teaming up once again with Estrella Galicia, which has extended its commitment to the music initiative. One of music's greatest champions here in Spain, Estrella Galicia presents 150 concerts at venues across the country and backs independent, alternative festivals. They are right at home with Música a les Places, a genre-spanning festival that offers live music in one of a kind places. The Formentera Council thanks Estrella Galicia for its support and salutes the company for its longstanding commitment to music- and culture-driven initiatives.